This literally means 'before-before' and whilst this may sound strange it forms the best opportunity in Kendo. Sen-senno-waza means the attack is made just in the instant before a movement is made. This is done just before the opponent's point stirs and whilst his mind is occupied with the decision to attack. In this split second he can neither defend, nor perceive our own attack. In my own experience with high ranking teachers nothing will happen until the student decides to attack. But as the thought arises it is suddenly too late, since the teacher has just stepped forward and struck. As with most Kendo the observer will note nothing other than one side has struck. But to those concerned a very definite and skilful technique has been employed. Whilst the lower Dan grade students may catch this timing occasionally it is a permanent factor with skilled teachers and is again a question of sense and intuition. There are said to be such techniques as Sen-Sen-Senno Waza but I must confess this is beyond me at present! The Oji-waza or reply techniques are often designated as Go-no-senno-waza or techniques 'after-before', since they occur after the crucial time. The above techniques of Sen-Sen, Dehana and Senno-waza are regarded as the most important since they illustrate the real heart and spirit of Kendo. 'As your opponent attacks ... you attack' this is often said and no thought of defence should occur if Kendo is to be understood fully. In olden times it was necessary to dispose of the enemy and the loss of one's own life was regarded as a fair bargain if no other alternative was possible. When practising with a highly graded Master the blows are either not seen at all or appear to be merely 'lucky hits' taken just because we were not prepared. It is only when this happens again and again that the student realises that this is in fact the real essence of the technique. In a case where the teacher is seen to step forward very casually and strike, whilst we just do not move, or react far too late, this means the attach time at the turning of the breath has been taken. As the breathing changes and turns, so the consciousness lapses for an instant. This timing can be taken accidentally but in reality the opponent's breathing cycle is sensed and one's own breath keyed in to compliment this so that any attack made to our breathing phase will be timed exactly. A moment of distraction, breath change, a blink or outside disturbance or thought (Sen-sen-senno-waza). 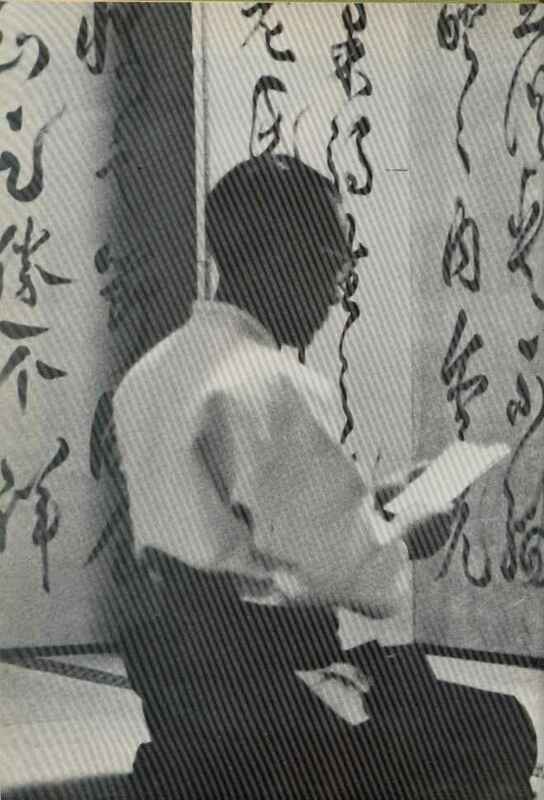 Immediately prior to the beginning of any action (Sen-senno-waza). As the mind is involved in beginning the action (Dehana Waza and Senno-waza). As the mind is involved ni the finish of the action (Renzoku and Oji-waza). As the mind relaxes just after the completion of the action (Hiki-waza). Each of these points is known as a Suki or 'mind stopping' and it is only at these times that it is possible to strike. It is impossible to be so fast as to hit even a novice, providing he has normal reflexes and a basic knowledge of Kendo. Speed is of importance but of no use unless timed correctly. The crucial moment which will decide whether or not the attack is a success is not the moment at which the blow lands but the moment at which the blow starts. Since we can hit many times, even in the early days this aspect is often not fully understood and since the above five moments are constantly occurring and re-occurring there are plenty of opportunities. The idea is to take them as definite applications rather than merely by luck. Returning to the aspect of 'mind stopping' it is obvious that in the vast majority of cases we are struck merely because the blow was not seen in time, and this because our mind was held at another point. The idea of non-stopping of the mind is expressed in the Zanshin or 'lingering of the heart' in that awareness should be maintained even after cutting and the mind is not stopped at that point. Providing the opponent is practising seriously it is possible either to draw him forward to attack, or to make it very difficult merely by our own spiritual condition. If we take a positive mind and press our spirit forward the opponent will reciprocate and a pressing feeling arises which feels like two opposing magnetic poles. If the opponents are both very strong willed, it may even appear that the tips of the Shinai or swords are clamped together. If one side suddenly draws his spirit inwards the opponent is forced to attack without his own volition and although he may not be aware of this he will be completely under the control of his opponent. This is a little difficult for the average Westerner to grasp but is easily demonstrated by causing a student with closed eyes to sway forward or backward at will merely by suggestion. In olden times it was the Samurai custom to look into the eyes of other passing swordsmen and test their spirit. If the fighting mind is suddenly taken off and replaced with a vacuum the other's spirit is taken away and a peculiar feeling is felt in the stomach. In this way the Samurai could assess his rival and it was not necessary to draw swords to discover who would win unless the loser could not understand this factor. More of this timing or spiritual feeling can develop without dedicated training and it develops quite naturally of itself so the student should concentrate on his exercise but also train this other side from time to time.